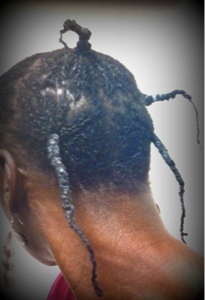 I applied coconut oil to reduce hygral fatigue and prevent my twists from getting matted. I let the coconut oil sit in my hair for 30 minutes. I put my twists in about five braids. This is how I wash my hair when it is loose. It prevents my hair from getting knotted. I then put on a wig cap which covered my entire head. I got this idea from Napptural85. She suggested using a sheer pantyhose but the wig cap works the same way. I believe this process reduces the force at which water touches the hair and slows down water absorption, which in turn reduces frizzes. I placed some conditioner on top of my head and just let it sit for while. A better way to do this, is to apply your cleansing product mixed with water in a spray bottle. After about 10 minutes with the help of the steam from the shower, the conditioner melted into my twists. 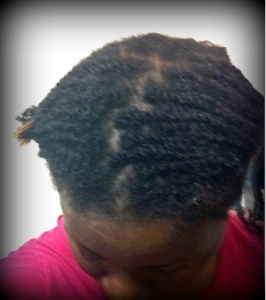 I did not manipulate the roots at all because my twists get seriously matted when I do so. In fact, I did not do any manipulation at all. I just rinsed my twists till I was confident that all the conditioner was rinsed off. Just showing what my twists looked like after rinsing. They are not frizzy but the roots do not look as firm as before, which is okay because this makes my hair looks fuller. 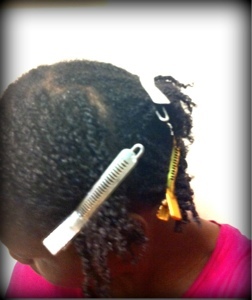 Using clips to section my twists, I applied my leave-in to each section and sealed with Jojoba oil. 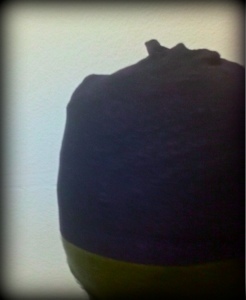 I threaded each section using a weave thread. This is to help stretch my twists as they shrank during the cleansing process. I took out the threads before my hair got 100% dry because my ends would look very stringy if I didn't. My thoughts on using a wig cap to cleanse my twists. This method is effective as my hair did not get matted. 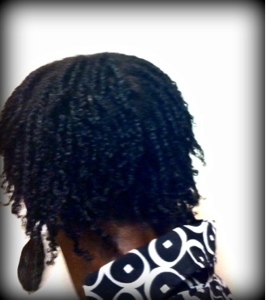 I believe that washing my twists in braids and not manipulating them made a big difference as well. What about you? 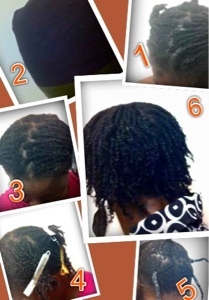 Do you wash your twists and how so? I don't usually wash my twists. The longest I keep them in is two weeks, so I can make it that long without feeling like I need to wash them if I've installed them on freshly washed hair. You know, this is very helpful because I was just about to start a thread to ask questions about this very issue. The 2 strand twists end up not being a protective style for me, more of a damaging one, because when I put them in for beach vacays or while I'm consistently working out, I always end up with "almost-locks" by the end of the week. I will try the cap. So you don't manipulate at all, when the cap is on, not even to scritch the oil/dirt/perspiration from your scalp? Do you rinse your cleanser or conditioner out with the cap on or off? No I do not touch the roots as my hair gets really tangled. 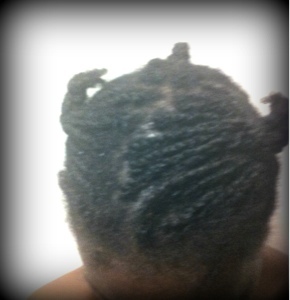 My hair in mini twists is stubborn. Yes I do rinse the conditioner off with the cap as well. Pls note that I use conditioners that I know are safe to leave in hair, in case it does not completely rinse out. I hope this helps. Twists get frizzy fast. It's ok to redo edges and the visible roots.